As Jenny says: You can’t experience pain without also experiencing the baffling and ridiculous moments of being fiercely, unapologetically, intensely and (above all) furiously happy. It’s a philosophy that has - quite literally - saved her life. Jenny’s first book, Let’s Pretend This Never Happened, was ostensibly about family, but deep down it was about celebrating your own weirdness. 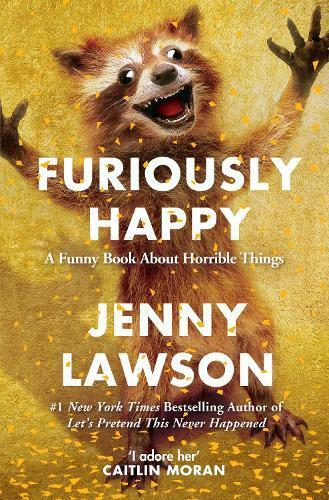 Furiously Happy is a book about mental illness, but under the surface it’s about embracing joy in fantastic and outrageous ways. And who doesn’t need a bit more of that? Furiously Happy had me from the title. Or, perhaps it was the stuffed raccoon on the front cover? Hard call. But a happy read was high among my hopes. Following on from the success of her earlier book, Let’s Pretend This Never Happened, Jenny Lawson delivers again with a hilarious romp of a read that will have you curled over with laughter and gasping for breath. Laughing must be the best exercise for the stomach muscles as mine felt sore from laughing so much given the constant and unrelenting serves of hilarity. Lawson has a way with the ridiculous, setting up outrageous scenarios that grow in absurdity to such an extent that even your wildest imagination couldn’t prepare you for where she’s going to take you. Seriously, Lawson is so unpredictable that I’m certain she even takes herself by surprise! The comedic episodes in this book deserve to be experienced fully in the context in which they are written so there’ll be no spoilers from me. Suffice to say, this book is more than just a work of comedy. Followers of Lawson’s blog The Bloggess will know of her life-long struggle with depression and anxiety. Lawson is up-front about her mental health issues and there is an honesty about her struggle that is real and humanising. Natalie Platten works as a bookseller at Readings Malvern.